Soak up the medieval romance of Venice by land and by sea on this combo walking and gondola tour. 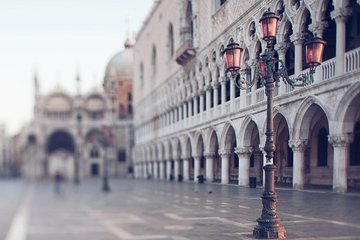 Learn about the history of the mighty maritime republic as you explore the famous monuments of St. Mark's Square with a guide, stopping outside St. Mark’s Basilica and the Doge’s Palace. Then, climb aboard a traditional Venetian gondola for a shared ride along the Grand Canal and some of the city’s quieter waterways — a classic Venice experience. we have opted for this tour as it states that it shows you and takes you all around Venice important sites and also shows you Venice from the local's point of view. Well, it did nothing of the sort! The guide did not take us to any Venice landmarks, did not stop for any photos and only showed us the narrow streets of Venice nothing major! the gondola ride was a big flop!! where it states that it will take you for a 30mins of gondola ride through the narrow canals of Venice, this gondola ride only lasted for 20 mins and we only went out to the big canal and back in! the gondolier did not even explain anything to us! this tour was not worth the money!! This tour helped with giving me ideas as to whereabouts I wanted to visit after the tour was over. I expected more of a commentary and to learn more about Venice than I did. Gondola ride was great, they took us through some smaller canals and then to the Grand Canal. It was interesting, and the Gondola Ride was okay. I guess that I was a bit underwhelmed by Venice. This was a perfect tour for us. Our guide was local and brought us great background in introducing us to Venice. Highly recommend! You can't go to Venice without this Walking Tour and Gondola Ride. The streets are so narrow in Venice and it's easy to become confused. Our guide walked us through these narrow streets and told us quaint stores about the different neighborhoods. Also, highlighted interesting buildings, which one can easily miss. The city is extremely charming with its squares, bridges, and multitude of shops. After, the walking tour, we relaxed on the Gondola Ride. Sharing the ride was pleasant, however, the Gondolas are restricted for the canals and there could be some traffic. Boats and water taxi traffic We enjoyed Venice very much and this tour helped us have a better understanding of this beautiful city. loved the walking tour and the knowledge of the guide. Saw things I certainly wouldn't have found on my own. Little disappointed with the gondola ride. Gondolier not at all friendly it was very much done out of duty not pleasure. Overall though I would recommend the tour. Venice is just magical from all view points. Loved the walking tour through Venice. Our tour guide was extremely knowledgeable. Would highly recommend this tour. A great way to get acquainted with the city. Tour guide gave us lots of history and interesting facts. The gondola ride was a bit touristy but we felt it was a must if u visit Venice, and it was very pleasant and even fun. We were very pleased with the entire experience. A very insightful and fantastic tour to an introduction to Venice. Excellent. Our guide was very informative, and the Gondola ride was very good. We saw many interesting things that we wouldn't have if we hadn't done this walking tour. It was very interesting. With the gondola ride, it is shared. So you get in in groups of 6. My husband and I were lucky to sit together, as one couple was not, so be prepared. It's not your romantic gondola ride, so don't mistake it for that. But it was great fun.